'God became man in order that man might become God,' or some variant, is one of the dominant themes of the Greek Fathers from St. Irenaeus forward, the exegetical development of the scriptural phrases 'you are gods, sons of the Most High, all of you' (Ps. 82:6) and 'that you might.become partakers of the divine nature' (2 Pet. 1:4). The doctrine of deification (theosis), human persons becoming divine by grace, became the cornerstone of the Orthodox doctrine of salvation, the goal of human cooperation with the sanctifying energies of God through the Holy Spirit in the Church. Describing the development and content of this vision of human destiny strikes one as a little like trying to bottle light, but Norman Russell is a trustworthy guide. He systematically narrates the history of the doctrine, with extensive chapters on precursors in the Greco-Roman world, in ancient Judaism and the New Testament, and of course the Greek Fathers. 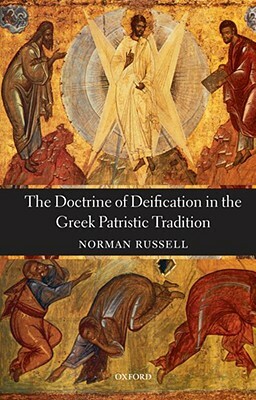 Russell's original contributions are his discussion of deification as a metaphor with two distinct emphases, 'the transformation of humanity in principle as a consequence of the Incarnation.and the ascent of the soul through the practice of virtue;' and his survey of recent Protestant, Catholic, and Orthodox engagements with the doctrine, ranging from Harnack's dismissal of deification to Vladimir Lossky's insistence that it lies at the very center of our understanding of God and humanity. 418 pp. Deification in the Greek patristic tradition was the fulfillment of the destiny for which humanity was created - not merely salvation from sin but entry into the fullness of the divine life of the Trinity. This book, the first on the subject for over sixty years, traces the history of deification from its birth as a second-century metaphor with biblical roots to its maturity as a doctrine central to the spiritual life of the Byzantine Church. Drawing attention to the richness and diversity of the patristic approaches from Irenaeus to Maximus the Confessor, Norman Russell offers a full discussion of the background and context of the doctrine, at the same time highlighting its distinctively Christian character.